Offering strong and secure external composite doors to the trade and DIY. Delivered free in Gwynedd and surrounding areas within 5-9 working days. Door prices start from just £439 inc VAT and come fitted with a Police Approved multipoint locking system as standard and pre-hung in a thermally reinforced upvc outerframe. 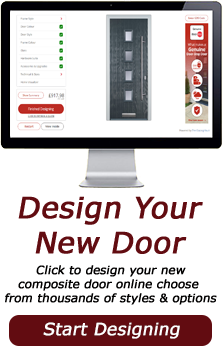 Available in a range of composite door styles with 13 different door colours and 9 external coloured frame choices along with a great selection of modern and contemporary style door hardware. We offer a vast selection of made to measure front doors, back doors, modern style composite doors, fire doors and timber composite doors in the following towns, villages and surrounding areas.